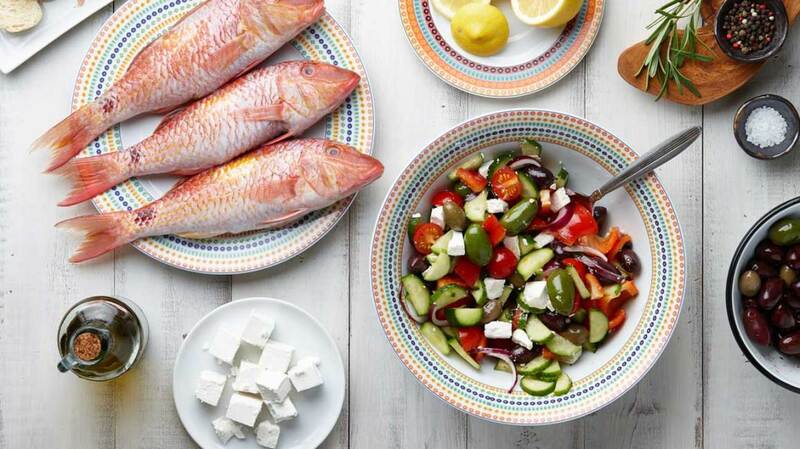 The Mediterranean Diet is a diet that is based on the eating habits of Greece, Southern Italy and Spain in the 1940s and 1950s(1). This diet mostly consists of olive oil, legumes, unrefined cereals, fruits, and vegetables, moderate to high consumption of fish, moderate consumption of dairy products such as cheese and yogurt, moderate consumption of wine, and low consumption of nonfish meat products(2). There is evidence that the Mediterranean diet may reduce your chances of getting Cardiovascular Disease and Cancer due to consuming more fruits and vegetables, as well as less red meats(2). Olive oil is also a huge component in the reduction of the chances of getting cardiovascular disease and olive oil also leads to a decrease in neurodegeneration(3). Also, this diet seems very flexible as it doesn't seem as restrictive as the other diets I have reviewed. It seems like you can easily sustain this diet for long periods of time. There is evidence that this diet can possibly reduce the risk of many different diseases and health conditions(4). So the first con on the list is the fact that this diet encourages people to drink wine. This isn't always an option for those who can't drink alcohol for health reasons or they are on medications that would have a bad reaction. The second con is the fact that there isn't a specific serving size on here for the amount of each food that you need to eat. It is a very vague description to say, "low consumption" or "moderate consumption." What does that mean? We need an exact number. Dieting is about counting the macronutrients that you eat and the calories that you eat. Overall, this diet has shown to be good for your health as it has lots of health benefits and it seems to be sustainable long-term as it isn't too restrictive. It isn't good for those who can't drink alcohol for health reasons or because they are on medication that could have a dangerous reaction to alcohol. Also, there isn't a specific calorie count or specific count of each macronutrient that you need, so the best way to lose weight on this diet is to combine it with a calories-in-calories-out approach to weight loss. Remember, you need a calorie deficit to lose weight. The Mediterranean Diet was never meant to be weight loss "diet". In this use, diet simply means food consumption, or nutrition plan. Sorry, but your lack of knowledge is showing. Where did I ever claim that this diet was intended to lose weight? I am simply explaining the facts about this diet in an unbiased matter. Sorry, but your lack of reading comprehension skills are showing.